1). Flat Design: Can You Benefit from the Trend? 3). Skeuomorphism in User Interface Design, What is It? 2). A Conversation: Is “Flat” the Next Trend in Design? 3). Is “Flat” UI design better? To find more (the most fresh) links on flat web design, follow our Pinterest board Flat Web Design. Nice post. Helped me very much, thank you. Hi Helen, thanks for the link! 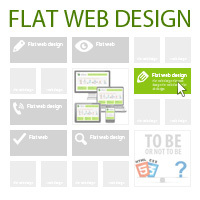 I know it too, and it’s mentioned on our Pinterest board Flat Web Design. Thanks for these awesome web design tips. I will remember these tips in my upcoming projects for great response.